Not all of Srila Prabhupada’s disciples share Jayadvaita’s and the formal GBC decisions to make so many changes to Srila Prabhupada’s books. We see a very real and holy sacredness in the books that Srila Prabhupada personally gave approval of and used in lectures for years. I am not opposed to correction of a limited few and obvious grammatical errors, but I have been opposed to the massive Gita changes since the very beginning, long before I knew there were massive changes in the editing, or what all the changes were. We were in Detroit in the early 80′s when a number of the GBC members held a closed door secret meeting where they discussed the changes to Srila Prabhupada’s books. At the time of the meeting they would not even tell us what the meeting was about. On regaining the rights to his unabridged Gita, Srila Prabhupada gave Ramesvara instructions regard future printing. In those instructions it is my understanding that there was absolutely no mention by Srila Prabhupada that the wording should be Changed!!! Prabhupada had used that Gita for years. He gave classes from it, and we have no record of him ever asking that massive changes be made. That it be edited and changed to make it ‘perfect’. Where are such orders from Prabhupada? Ramesvara, at the time, told the artists, including myself, what changes Srila Prabhupada requested, and it was concerning the paintings. Ramesvara never mentioned to us, and we also knew the BBT proof readers and editors as well at that time, and they never mentioned any order by Srila Prabhupada to edit the wording. The only instruction Ramesvara told us, either the same day Prabhupada gave the instruction, or just days after, was that he wanted many more paintings. Srila Prabhupada ultimately wanted 108 full color plates, but told Ramesvara that in the next printing there should be Minimum 54. 54 is 1/2 of 108. Ramesvara told us that Prabhupada wanted, in the next printing, a minimum of 54 color plates. But, there was no BBT printing until the early 1980′s, when the mass changes to wording were made. I was still in Detroit when the new changed printing came out. It had been many years since the last MacMillan prints were made. ISKCON / BBT had either run out, or very low on Gitas, so, this printing was long awaited and long needed. When I got the new Gita, the first thing I noticed was the changed cover. That bothered me, as Srila Prabhupada had not asked for the cover to be changed. He wanted new paintings to be added, but had told Ramesvara not to change the existing ones. Why the cover was changed? Then, I immediately thumbed through to look at the paintings. The paintings were the first thing, because I knew what Prabhupada told Ramesvara, to increase them, 54 minimum. I was shocked and bewildered. There were not more paintings, there were no 54 paintings, there were far FEWER color plates. And, worse, the disciplic succession was taken out of that printing. In the MacMillan Gita aside from Srila Prabhupada’s picture there is Srila Bhaktisiddhanta Sarasvati, Srila Gaur Kishore, and Srila Bhaktivinoda Thakur. But, in the new ‘changed’ Gita there was only Srila Prabhupada. All the other Acaryas had been removed. My heart sank. And, I knew that very second that Srila Prabhupada was not pleased with that new botched reprint. This was NOT what he asked for. A few weeks later Ramesvara visited Detroit, where I was living, and I made an appointment to see him privately. I asked him, point-blank, why the past Acaryas were removed? His face remained stern and quiet, then I reminded him of Srila Prabhupada’s instructions to him, that there be minimum 54 plates, and yet, this new changed Gita had fewer prints? Ramesvara took the defensive and became immediately angry. He raised his voice and said, “Ameyatma, you are not a Preacher. You are not a real devotee of Caitanya Mahaprabhu because you have no understanding how to Preach.” He said that that instruction by Srila Prabhupada was not practical. And that what Srila Prabhupada really wanted, more then increasing the number of color plates, what he really wanted was More Books distributed. Ramesvara argued that adding color prints to 54 would have raised the cost of printing so high that no book distributors would be able to sell it. To keep the costs below $3.50, so that book distributors could sell at $5, he not only did not increase the color plates, but he purposefully took many out, to reduce the cost, to keep the costs lower. But, I countered that Prabhupada’s order was to be followed, and that we should not try to think we are more intelligent. If we simply follow what he wanted, then the result will be perfect. If we thwart what he wanted, then no good result will come. This logic simply made Ramesvara raging mad with anger. He pounded his fist on the table and repeatedly shouted, “You are not a Preacher, Ameyatma, you are not a book distributor and therefore you are not a real devotee of Lord Caitanya, therefore you have no understanding. Because you don’t distribute books, you can’t know what Prabhupada wants. He said he wanted more pictures, but a preacher knows he really wants more books. You are simply a fault-finder, finding fault with the real devotees of Caitanya, and finding fault with the real preachers.” And, then he went on lecturing me how I was so fallen, and boasted how he was now an Acarya, and that I was committing a great offense by trying to find fault with him about his decisions. That meeting left a black rotten taste in my mouth. This was the attitude and mood behind the printing and changes of the new Gita! At the time I had absolutely no knowledge that there was even one grammatical change made, what to speak of en mass. All I knew was the attitude behind the changes to what Srila Prabhupada said he wanted was wrong. Srila Prabhupada’s instructions were thrown out, what he wanted was thrown out, and other opposite changes occurred. From that day onward, I wanted absolutely nothing to do with the new changed Gita, and as I said, it had nothing to do with the changed edits that Jayadvaita made. I had my own separate reasons for rejecting the new Gita. The taking out of the past Acaryas was proof enough to me that Ramesvara was the one who had no real understanding. And, his angry defensive attitude during our meeting finalized my conclusion, that the new changed Gita was not at all pleasing to Srila Prabhupada. Thus, I kept my original Gita ever since, and for years had no other Gita at home. Years went by, and sometime around 1996 or 97 or so while living in Alachua, Virabahu was visiting Alachua. He was GBC for Alachua at the time. We were old friends back before he had become a guru and then GBC, so I invited my old friend over to my house for a program. He agreed to come and probably 50+ devotees came for the program. On arriving, he asked me for a Gita so he could give Gita class. I handed him my original MacMillan copy. Now, at the time I had avoided the controversy over the changes that Jayadvaita made. I simply did not want the new changed Gita due to the above reasons. But, many years had gone by, and in 96-97 I wasn’t even thinking about it. When I handed Virabahu the Original Gita, his out-reached hand jerked back when he saw it was the original Gita. He then looked at me incredulously and said, “Why are you handing me this Gita?” I wasn’t into politics, I had no idea what his problem was. I said, “What’s wrong, this is the only Gita I have”. He said, “What? I can’t give class from that Gita“. Then he turned to others in the room and said, “Can someone go home and get me a BBT Gita“. This created a bit of a stir, and one devotee come over to me and asked what sort of political statement was I trying to pull off by handing Virabahu an original Gita? Another told me that was so uncool and fallen of me to try and force Virabahu to give class from “one of those” Gitas. That was it. Before then I had avoided the Changes controversy. But, what the HELL was going on? This had been my One and Only Gita for nearly 25 years at that point. It was the SAME (version) Gita that Srila Prabhupada had given classes from all over the world for years. It was the SAME Gita that he fought for to get back the full printing rights to. This was Prabhupada’s Gita, and yet, here a GBC treated it like poison, like it was a deviant political statement to give class for ‘that’ (banned?) Gita. We know of no instruction by Srila Prabhupada asking us to make massive changes to that Gita. When he won back the full printing rights to HIS Gita, He only asked that we increase the number of color plates, he Did NOT ask that we edit it and change verse after verse after verse. Until that day I had no idea what the controversy was over the ‘changes’, I had my own reasons for rejecting the new changes. But, after that, I could see, again, a sick attitude by those who supported the changes. Virabahu jerked back his hand and would not even touch the original Gita, as if it were poison to him. Others told me it was a political statement to give a class from that Gita. GREAT then, I will make it a political statement in their eyes, if that is how they see it. This is the SAME Gita Srila Prabhupada spoke from, had read to him, gave classes on. And, they won’t even touch it, seeing it as poison. So, you have your way of seeing things, and may side with Jayadvaita, but not all Srila Prabhupada’s disciples see it that way. Some do get upset and terse in their language at times, but that does not negate the underlying issue. It is simply an easy cop out for you to label us all as fallen fault-finders. For those who disagree, over the years we have had no voice, and so it gets very frustrating in dealing with those whom we disagree with. The GBC has, formally, stood behind the changes, and they are the ones who have politicized the issue, as I saw personally in the actions of Virabahu, who jerked his hand back and refused to touch Srila Prabhupada’s original Gita, and refused to give a class using the same version that Srila Prabhupada himself used. He is the one who made a bold political statement that night, I simply didn’t have any other Gita, I wasn’t trying to make any such statement, but he and his followers did. And, I do not agree with their political views. I consider his view, his actions, and those the GBC and Jayadvaita Swami as deviant, politically based, and fallen. Yasoda-nandana: In the Gurukula we were teaching Isopanisad class to the children. So we took… [break] …Prabhupada and the words which the recent edition of the Press is wrong. Many changes were brought. They were trying to make better English, but sometimes, to make better English, I think they were making philosophical mistakes also. There is no so much need of making so much better English. Your English is sufficient. It is very clear, very simple. We have caught over 125 changes. They’re changing so many things. We are wondering if this is necessary? I will show you today. I have kept the book. Prabhupada: I know what these rascals are doing. What can be done? How they can be relied on? Svarupa Damodara: It’s not the responsibility of the BBT trustee, to see these things don’t change without Prabhupada’s sanction? Prabhupada: And Ramesvara is indulging this. The great rascal is that Jagannatha? He’s there in Los Angeles. Prabhupada: And the one rascal is gone. Prabhupada: Hm. He’s a dangerous, who maintains these rascal with this work. He’ll always have questions and alteration. That is his business. That is American business. They take that always. What can I do? Ultimate, it goes for editorial. They make changes, such changes. Tamala Krsna: Your original work that you’re doing now, that is edited by Jayadvaita. That’s the first editing. Prabhupada: So how to check this? How to stop this? Tamala Krsna: They should not make any changes without consulting Jayadvaita. Prabhupada: But they are doing without any authority. Svarupa Damodara: I think we should make whole survey, all books already printed, before printing the next batch and check any mistakes so that it should be all corrected. Otherwise, if the scholars find out that there are so many mistakes in the books, then the quality and the appreciation will be reduced. Svarupa Damodara: Yes. We find so far that they are appreciating so much within the scholarly circle, and we want to maintain that actually. Yasoda-nandana: Bhakti-prema, Satsvarupa is there. Tamala Krsna: So Bhakti-prema… That’s a good solution. Svarupa Damodara: I think they’re working too independently without consulting properly. Tamala Krsna: Sometimes there’s a fear that some word will be unpopular, and on account of desire to gain popularity or acceptance, they lessen the strength of the word. They change the word. They choose a word which is more so-called acceptable. Prabhupada: So you bring this to Satsvarupa. They cannot change anything. Prabhupada: So they are doing very freely and dangerously. And this rascal is always after change, Radha-vallabha. He’s a great rascal. First, about Radha-vallabha. In ’76, Srila Prabhupada came to LA and took a tour of the BBT offices. Prabhupada found that many grhastas were being maintained by the BBT. So, Prabhupada said, no salaries, BBT was not to hire grhastas. He said all work was to be VOLUNTARY. Grhastas, he said, should get outside job and work outside to earn income, then they can volunteer service for the BBT in the evenings and weekends. And, brahmacaris, he said, they can do service and be maintained by the temple, but not the grhastas. Besides, BBT was paying for their apartments, paying the temple for their meals, and paying them salary. Even though it was stipend, living in poverty, Prabhupada on principal did not want BBT to maintain grhastas. All service to BBT must be voluntary. This Jagannath Suta was grhasta and BBT was paying him. Srila Prabhupada wanted him off BBT payroll. But, Radha-vallabha rejected this idea. He argued with Prabhupada that these grhastas (including himself) were essential to the operation of the BBT, that book publication, and then distribution will suffer and decrease if they follow what Prabhupada wanted. Prabhupada insisted, and in the end, Ramesvar and Radha-vallabha kept maintaining most of the grhastas, and that has been followed ever since. he is also implicating Ramesvara, he is directing, he is behind all this. When this Jagannath Suta was finally let go by the BBT, he got very upset and left ISKCON and became a born again Christian and began preaching against ISKCON, and against Srila Prabhupada. Just see. But, what started this conversation? CHANGES to his books. 125 changes to the Isopanishad. Srila Prabhupada was not pleased at all. He never said, oh, they found so many errors, good work. He never asked, oh, so many errors, what were they? He did not care what changes they made, but, wholesale changes he was against. Only others are suggesting that they go through and make changes to his books and try to make them perfect. Only others make that suggestion, and no where does Prabhupada actually agree, rather, he says things like, What is to be done? What to do? And says, it is now starting…. When he does state what HE wants, he says write a letter and tell them NO CHANGES, and he says, Next Printing, go back to the ORIGINAL. Others suggested changing to make it so called ‘perfect’ but those were not Prabhupada’s words, not his suggestion, not his request, not his order. His order is, NO CHANGES – Go Back To The ORIGINAL. That is what so many of us want. We are fed up with all the changes, changes, changes. We see this conversation and we hear Srila Prabhupada is not happy with changes, others suggest changes, but, he says NO CHANGES Go Back to the Original. Devotees have been crying fowl for over 30 years, for at least the last 25, and the GBC calls us fault-finders, even when we have presented our side in a civil and respectful way. So, devotees like Hasti are simply expressing their frustration in dealing with this. So, he used sarcasm and you see that as fault-finding mentality. Sorry, after being ignored and labeled in derogatory terms for simply wanting to see that Prabhupada’s orders are carried out, No Changes, go Back to the Original – we want his Sacred Works preserved – AS They WERE, otherwise, we see this conversation and we see how Prabhupada was upset, calling them all RASCALS, and we are fed up. We point out they are rascals, and we are demonized. Hopefully you can see the real issue we have with the changes to the books. I have the original books. They were as clear and readable in 1975 as they are today. I bought original Gita complete edition with red cover The Macmillan Company at the loi-bazaar, Brindaban. I thank you for the reply you sent me,I myself am a new devotee and I find Srila Prabhupada’s books very motivating. I don’t see any need for his books to be changed or revised, I pray that KRISHNA will guide us in this regard. 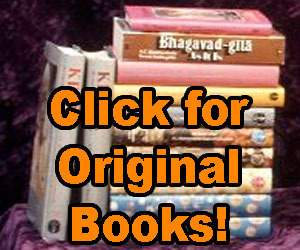 Why are the gurus of Iskcon not crying out: “STOP CHANGING PRABHUPADAS BOOKS”!!!!? Kali yuga — this is answer. But you may make your own spiritual experience, any books are only the maps. Everyone must to see original light (Brahman), next step is Vishnu himself and any books do not help you. Life is so short you have to realize Brahman vision! At last I can say that we have The Knowledge about Krishna but in general mass we cannot to see Supreme Effulgence Brahman this is the big,big problem! We think that perhaps some book or somebody made this problem for us, not, only I myself must do it. Parampara is handing down the teachings of Krishna like ripe mangos from the top of the tree to the ground without bruising or hurting them.